I love soups and stews for dinner, especially when the mercury drops. 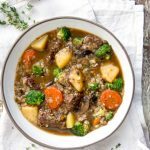 This beef mushroom soup is so hearty it’s practically a stew, with plenty of meat, potatoes and vegetables in a rich broth. This is exactly what I want simmering on my stove right now. If you’re not familiar with buckwheat, it has nothing to do with wheat. It’s has a wonderful nutty flavor, lots of protein and fiber, and it’s naturally gluten free. 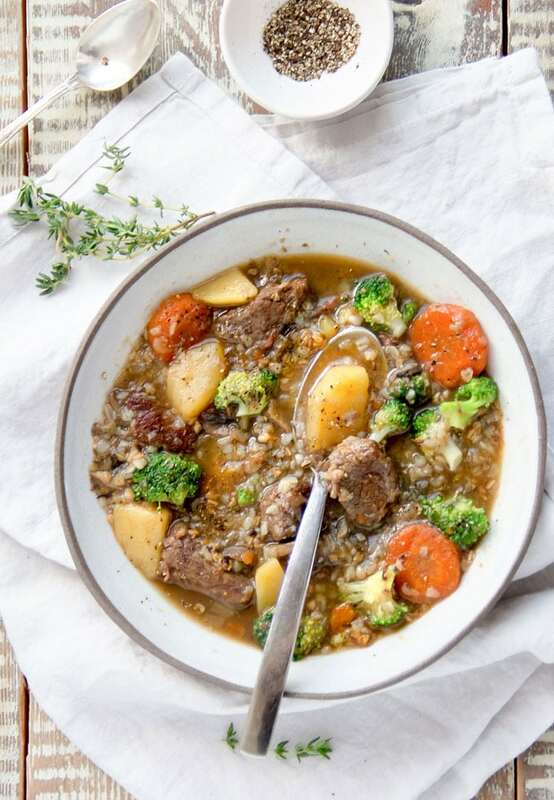 It makes a great substitute for barley, which is more traditional for this type of soup. One of my goals this winter is to cook the comforting dishes we crave, with maximum nutrients and minimum empty calories. There’s a lot you can do to make a delicious soup super healthy. 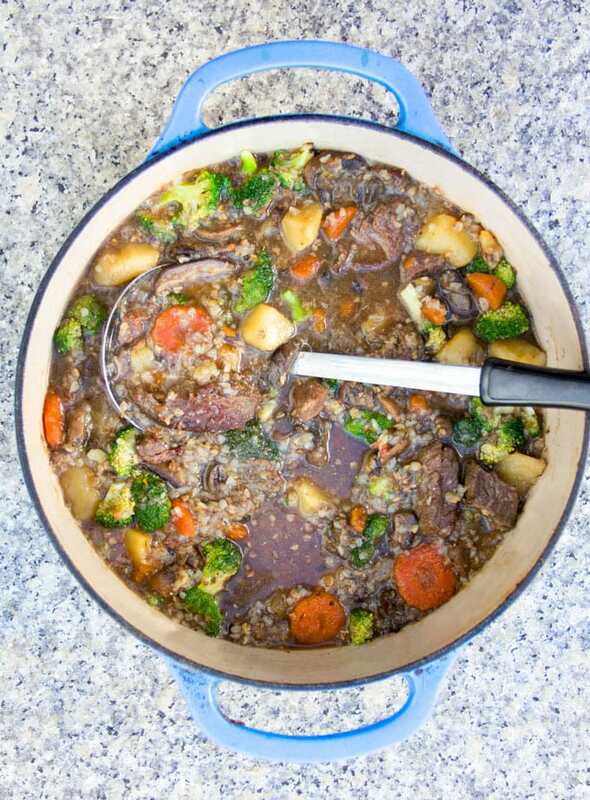 For a start, you can load it up with vegetables and buckwheat, like I did with this nutritious beef mushroom soup. A big bowl of this delicious satisfying soup will warm you up from the inside on a cold night. Start by browning the beef to create the first layer of flavor. Use good stewing beef such as chuck or short ribs. The benefit of using short ribs is that you can add the bones to the simmering pot, which will boost your broth with extra beefy flavor. After you brown the beef, remove it from the pot and sauté the mushrooms, onions, celery and garlic. Return the beef to the pot and add broth, carrots and spices (plus bones, if using). Simmer for an hour and forty-five minutes. When you cook soup, you’ll notice that as soon as it comes to a simmer, foam rises to the surface. This is more pronounced when bones are present. This foam is coagulated protein. The soup will be equally delicious whether you skim the foam or not. But if you leave the foam, it will disperse into the soup, making your broth cloudy. If you skim it off, you’ll get a brighter, clearer broth. Skimming soup is like a zen practice for me. I enjoy standing over the pot for ten minutes or so, watching my soup simmer, stirring it, skimming it, inhaling it. I’m not including this ‘practice’ in the recipe directions because it’s not crucial to the outcome and not everyone wants to hover over their soup. I do. After an hour and forty five minutes of simmering the beef should be tender. Now it’s time to add potatoes and buckwheat. If you’re not familiar with buckwheat, here’s a little background. Buckwheat is not a grain. Cereal grains, such as barley, are the seeds of grasses. Buckwheat is the seeds of a flowering plant. Buckwheat has lots of vitamins and minerals, protein and fiber. It’s got a distinctive nutty taste and it’s naturally gluten free. Buckwheat is a fairly common ingredient around the world. The most well-known dishes use buckwheat ‘flour’. Japanese soba noodles are made from buckwheat flour. So are blini, tiny Russian pancakes topped with caviar. Whole buckwheat groats – which I used in this soup – are more common to Eastern Europe, where he groats are toasted and then cooked like rice. Toasted buckwheat groats are called “kasha.” You can find kasha in the rice or bulk section of the grocery store. 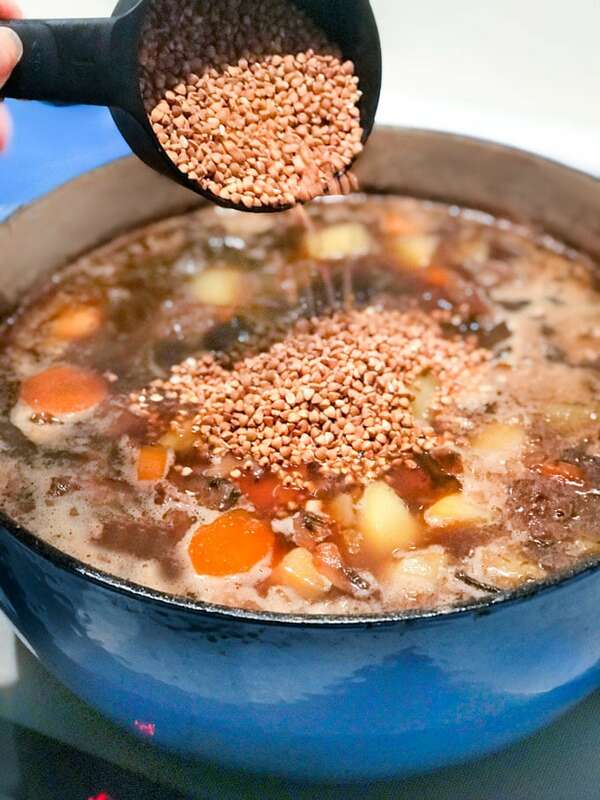 Buckwheat adds a rich comforting creaminess to this soup, similar to what barley does for beef barley soup. The final step of this beef mushroom soup is to add the broccoli florets. They only need about five minutes to become tender and bright green. You are essentially blanching them in the soup. A big bowl of this beef mushroom soup makes a hearty, satisfying meal. A simple green salad and and some crusty bread would be perfect accompaniments. Search #PotatoPalooza on Instagram and Twitter to find all of our recipes. 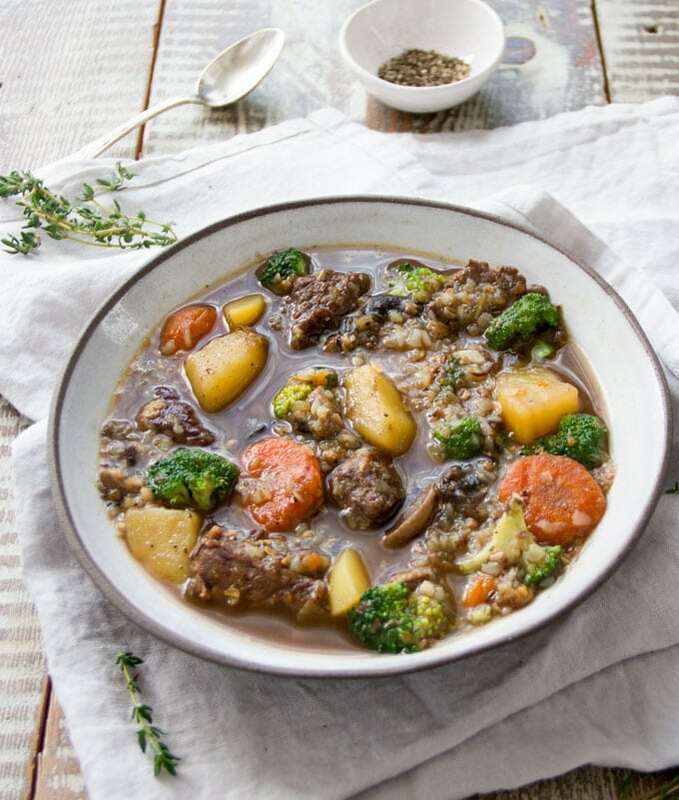 Here’s the recipe for Beef Mushroom Soup with Potatoes Buckwheat and Broccoli. If you try this recipe I hope you’ll come back to leave a comment and let me know how it turns out. 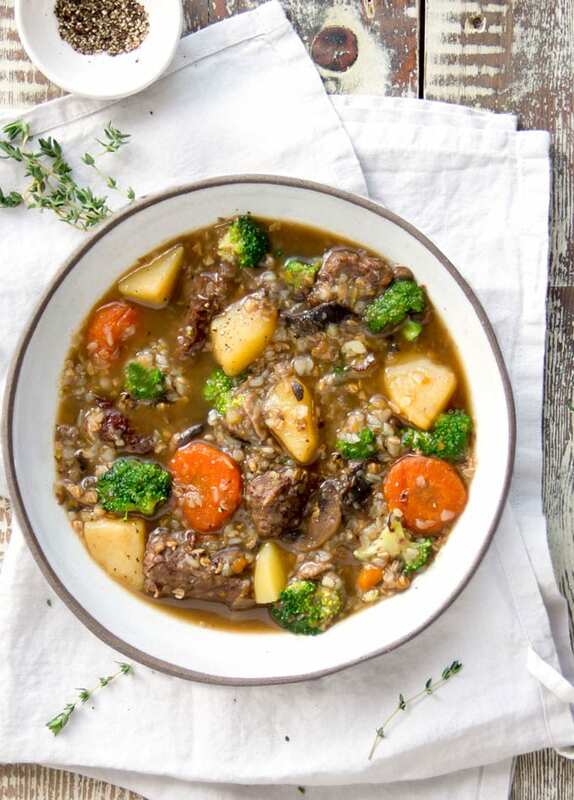 A rich comforting soup that’s hearty enough for dinner, with tender beef, potatoes, vegetables and nutritious buckwheat. Gluten-free. Season beef generously with salt and pepper. Heat oil over medium-high heat in a large heavy soup kettle or Dutch oven until very hot. Add half the beef and sauté, turning occasionally, until brown on all sides, about five minutes. Transfer to a plate and repeat with the rest of the beef cubes. Transfer to the plate and set aside. Add mushrooms, onions and celery to the pot. 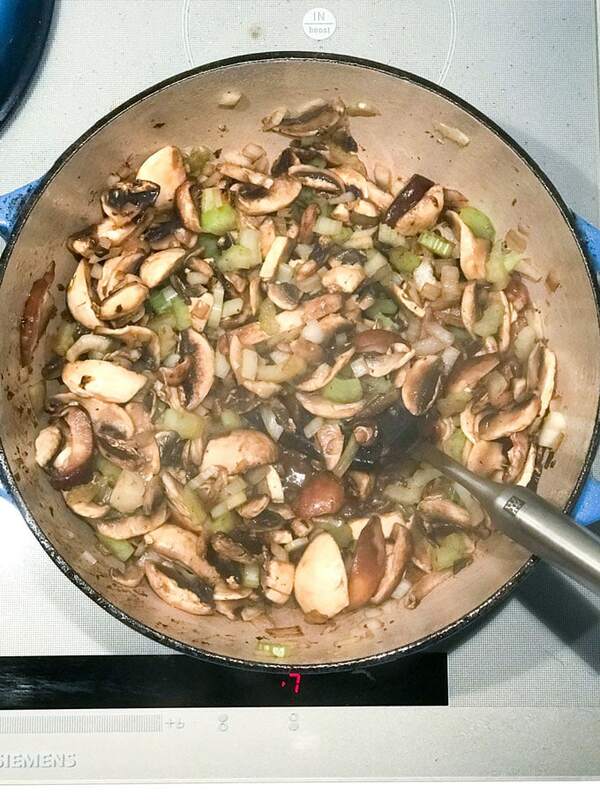 Sauté vegetables, stirring occasionally, for 7-8 minutes, or until the water released by the mushrooms is evaporated and the vegetables just start to brown. Add garlic and cook, stirring, for one minute. Return the beef to the pot. Pour in 12 cups of chicken broth, carrots, thyme, bay leaves,1 1/2 teaspoon of salt and 1/2 teaspoon of pepper. Bring to a boil. Lower to a simmer and cook, uncovered, for 1 hour and 45 minutes. Add buckwheat and potatoes. Bring the soup back to a simmer and cook for 20 minutes longer. Add broccoli and simmer for a final 5-10 minutes. If you want a thinner soup, add more chicken broth. Season, to taste, with salt and pepper. Ladle into bowls and serve hot. If you decide to use short ribs, I found that 4 1/2 pounds of short ribs (6 meaty ribs) yields 2 pounds of meat. I suggest cutting the meat off the bones and cubing it up. 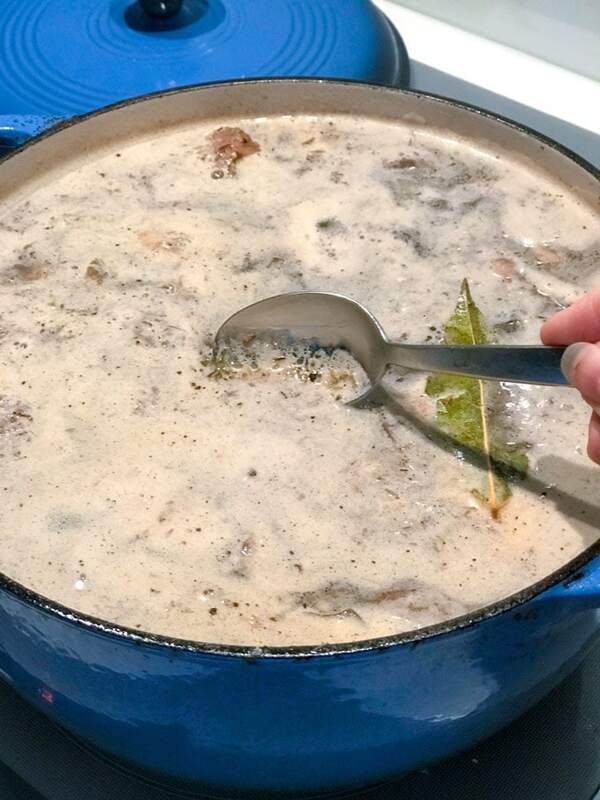 When you add the broth in step #3, add as many bones as comfortably fit in the pot. I added 3 and froze the rest for future broths. Love this recipe. Beef Mushroom soup is simply the best!